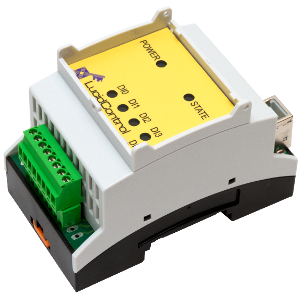 LucidControl consist of a range of unique IO modules for digital and analog data acquisition and control that are useful in many monitoring projects. The units are USB power supplied and work standalone without the need for extra adapters which makes LucidControl a very inexpensive equipment also for mobile products. A standard connection to the USB interface is enough in order to run the modules. 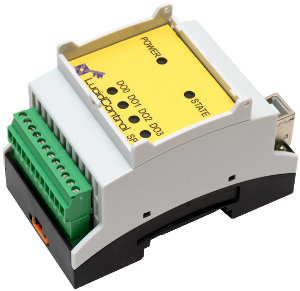 LucidControl devices can be easily integrated in switch cabinets which are quite typical in automation business simply because of the versatile DIN-rail mountable housing. For reliable projects it is also helpful that the units are equipped with high quality and industrial standard plug-able connections. For the do it yourself branch the affordable IO modules can be integrated into distribution boxes making it simple realizing a tidy and straight forward design e.g. for controlling lights. Because of an comprehensive user manual, professional programming utilities and APIs for several relevant development languages and also their simple usage make the USB IO Modules the best automation solution for beginners as well as for specialists. Learners might make their first programming experiences with LucidControl and profit by a big learning curve. Without needing further driver software, they are working immediately with most relevant computers and work with MS Windows® and also Linux operating systems. Extremely useful are the units also since they are compatible not only with ordinary PCs but also with the lately became popular small computers like the Beagle Bone Black. Using Linux OS these mini-sized computers are definitely best prepared to realize Internet programs making all I/O services available via the world wide web. 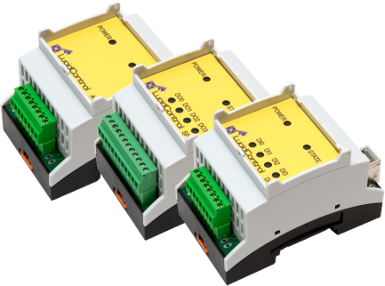 The LucidControl USB Digital Output Module is prepared to handle four logical output channels. The digital output module is able to switch electrical loads like pumps, valves or to produce various digital output lines. In order to give a maximum of flexibility, the output channels are carried out in 3 different ways. Available options of the digital output module are solid state relays (SSR), mechanical relay switches as well as open collector output channels which can be picked dependent on the practical needs. For insulated switching of power consumers while avoiding the drawback of wearing out of mechanical relay contacts, employing Solid State Relays provide the very best over all capabilities. These outputs are very best suited to control electrical power consumers such as heaters. On the other hand, when it comes to measurement channels such as currents which must be switched, mechanical SPDT relays suit best by allowing to manage these signals preventing distortion. Finally, the digital output module is available with open collector outputs are capable of generating high speed signal transitions as they are utilized for clocked channels that can be found in applications like controlling lights. Services such as time switches controlling the power of electrical consumers like valves can be developed easily due to the timing capabilities that are included in the Digital Output Module and allows the generation of pulsed signals. Our companies objective is it to equip the digital output module with plenty of interfaces to make them prepared for all projects. 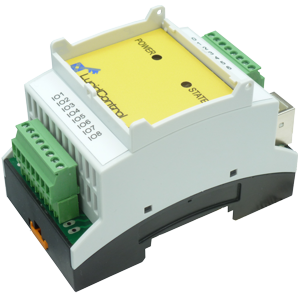 Extra insights relating to the LucidControl input and output units can be found on our web-page. Duty-Cylce Mode Generates a Pulse Width Modulation (PWM) by configuring cycle time and duty cycle. This mode can be used in order to control the power of loads by pulsing them periodically. LucidControl modules are easy to install and start working immediately after set up. The IO Modules are compatible with Windows, Linux, Raspberry Pi and Beagle Bone LucidControl provides drivers for all major operating systems. Command line tools and APIs for Windows and Linux are available. The API is ready for .NET, Java and Python.